We are Virtual College Limited, a company incorporated in England and Wales. Our company number is 03052439 and our registered office is at Marsel House, Stephensons Way, Ilkley, West Yorkshire, LS29 8DD (“Virtual College” / “we”/ “our” / “us”). We are committed to ensuring that your privacy is protected and we strictly adhere to the provisions of the General Data Protection Regulation ((EU) 2016/679) (GDPR) unless and until GDPR is no longer directly applicable in the UK, together with the Data Protection Act 2018, any national implementing laws, regulations and secondary legislation as amended or updated from time to time in the UK, and any successor legislation to GDPR and the Privacy and Electronic Communications (EC Directive) Regulations 2003 (Data Protection Legislation). In order for Virtual College to provide, our products and services we need to process a certain amount of data, some of which is personally identifiable. 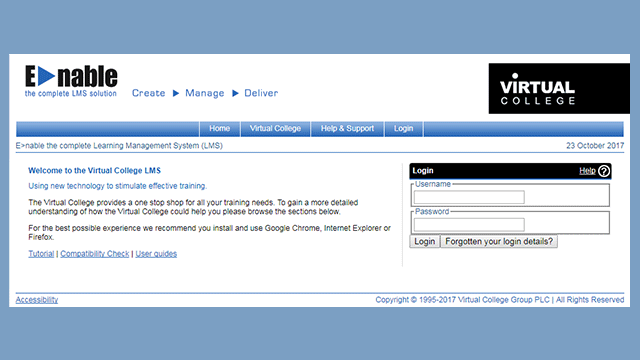 In order to access Enable, Virtual College’s Learning Management System (LMS), and complete training and other associated activities, users require an LMS account. Having an account means Virtual College is storing the personal data you provide, and we further process this to determine training outcomes and retain certification records as well as analyse content and system usage, improve our products and services and respond to support queries and evaluation comments. Where a learner has accessed or is allocated a Virtual College course, directly from Virtual College, Virtual College is the data controller. If your login details or training has been provided by a 3rd party (e.g. your employer, another training organisation or a Virtual College reseller) then they will be joint data controller, along with Virtual College where applicable and also have access to and will be processing your personal data. Should you require any further information you should contact them directly. 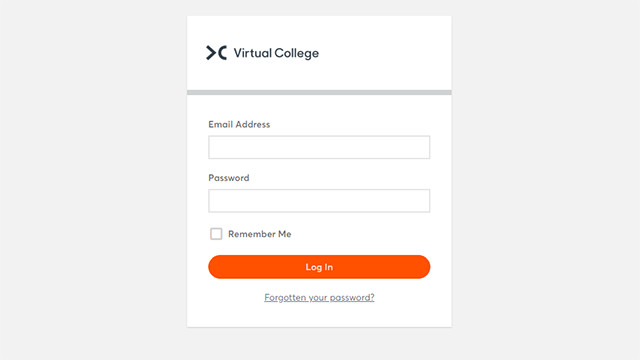 If you are unsure who to contact Virtual College may be able to assist, please email customersupport@virtual-college.co.uk. . Where a 3rd party has provided system access, and no Virtual College content is allocated to the user, then Virtual College is a data processer, and the relevant 3rd party sole data controller. Virtual College retains learning records ad infinitum, under its commitment to lifelong learning, to enable us to provide factual information on what a learner has studied and achieved, i.e. name, courses studies, CPD gained, test results etc. This is in line with JISC best practice and Guidance on Managing Student Records. Our servers are provided by Node 4 and Amazon Web Services. We also work with a number of organisations who assist us in testing our LMS and related infrastructure – Pure Technology Group and Ten10. Where learners complete one of our IOSH courses, personal data is shared with IOSH to enable them to issue their certification. Learners contacting our support team out of normal hours may be dealt with by our 3rd party support provider – Your Business Voice. Virtual College use Microsoft Dynamics 365 CRM (you can visit Microsoft’s Trust Center: here) to manage our business development and account management activity. All customers and prospective customers have a record with our CRM database. Along with details about the organisation and products purchased, we also store contact information for those people we know at the organisation. For customers we process this data in order for us to meet out contractual obligations, for prospective customers our condition for processing is legitimate interest. Please note that we require this information to be able to process your order and fulfil our contractual obligations (our condition for processing under GDPR). We may be unable to fulfil the contract without your personal data. If you purchase services, our third party payment provider (Braintree Ltd - you can view their privacy information here) will require additional personal information in order to process such payment (e.g. your home address). Please note that this information is not collected or stored by us. Your personal information will then be used by us to provide you with the services you ordered and to communicate with you regarding the provision of those services. We also monitor website usage and provide statistics to third parties for the purposes of improving and developing our website and the services we provide via our website. Please note that any such statistics and/or information provided to third parties will be made on a confidential basis and will not include information that can be used to identify any individual. Promote Digital assist Virtual College with the development and maintenance of our website. To identify repeat visits from a single user, Sitecore sends a persistent session cookie to the web client. The persistent session cookie expires 10 years after the last page requested from the solution by the web client. This site along with our Learning Management System, Enable, uses Google Analytics, a web analytics service provided by Google, Inc. Google Analytics sets a cookie in order to evaluate our use of our website and compile reports on user activity. This cookie expires after two years. These 1st party __atuvc and _atuvs cookies are persistent cookies that are created and read by the AddThis social sharing site in order to make sure user sees the updated count if user shares a page and return to it before Virtual College share count cache is updated. No data from that cookie is sent back to AddThis.These cookies expire after two years. By completing the form and ticking the relevant boxes you are providing your consent for Virtual College to process your personal data, and this is the legal basis we are relying on to do so. We will use the information that you give us to send you relevant emails containing Virtual College news & marketing communications. Your information will be stored by a third party data processor; Campaign Monitor, whose servers are located in the US, you can read their privacy information: here. In addition, if you have enquired about a product or service we will use the information you have given to update our customer relationship management system so one of our consultants or advisors can contact you. This information will also be stored by another third party data processor, Microsoft, their Dynamics 365 CRM servers are located in the UK, for more information you can visit Microsoft’s Trust Center: here. Some automation and profiling may be used to send emails or a series emails based on your indicated preferences and your interactions with the emails we send to you. For example if you have enquired about a particular product we may send you a series of emails outlining features or benefits of that particular product. If you continue to interact with our emails or website, we will retain your data indefinitely so we can continue to send you emails. We will not sell or pass your information to third parties other than those set out above. Information regarding the processing of staff data is available internally via the HR Team. Where staff provide 3rd party personal details to Virtual College, for the purposes of being an employment reference, emergency contact, or beneficiary of employment related benefits, these details are used for that purpose only, and processed under legitimate interests. Should you apply for an advertised job vacancy, or submit a speculative application, either directly or through a recruitment agency or other 3rd party, we will process your data solely for this purpose. We hold all applications on file for a period of 6 months, and may contact applicants regarding other similar opportunities potentially of interest that become available within this time. Virtual College utilise a number of sub-processers and other 3rd parties to support and enhance the delivery of our services. These are listed below. Protecting your security and privacy is extremely important to us and we make every effort to secure your information and maintain your confidentiality in accordance all relevant Data Protection Legislation. Our systems are protected by various levels of security technology, which are designed to protect your information from any unauthorised or unlawful access, processing, accidental loss, destruction and damage. You can ask us to confirm that we process your personal data and provide access to and copies of the information we hold about you by contacting us at customersupport@virtual-college.co.uk. We will process your request to access your information and provide this information to you free of charge unless your request is manifestly unfounded or excessive or repetitive, in which case we are entitled to charge a reasonable fee. We may also charge if you request more than one copy of the same information. If you believe personal data we hold about you is inaccurate or incomplete, or any of the information you provide to us changes, please let us know as soon as possible so that we can make the necessary changes to the information we hold for you on our database. If you wish to make any changes to your information, please contact us at customersupport@virtual-college.co.uk. We will comply with your request within one month of receiving it, unless we don’t feel its appropriate for us to do so in which case we’ll let you know why. We’ll also let you know if we need more time to comply with your request. To request that your information is deleted, please contact us at customersupport@virtual-college.co.uk. If you wish to restrict or object to the processing of your information, please contact us at customersupport@virtual-college.co.uk. We carry out automated decision making using your personal data as detailed under the Newsletter / Marketing Subscribers heading above.